When I found out that I was expecting triplets, I had no idea what I would experience when it came time for the birth. Would it be scary? Would I feel pain? Would my babies need to spend extra time in the hospital? If you are pregnant with triplets, or even just curious about the process, you might be wondering about the same questions that I had. I hope that you will read through my birth story, and learn a bit more about what it is like to give birth to triplet babies! I was advised at the early stages of my triplet pregnancy that the delivery of triplet confinements is generally by caesarean. At 32 weeks, triplet one was in a breech position, while triplets two and three were in a transverse position. Due to their positioning, I truly believe my doctor advised the best delivery procedure for me. My c-section was aimed at 34 weeks. However, when I was at 33 weeks along, there was a public holiday. It was going to be a long weekend, and if something unexpected happened during this time, I wouldn’t have had the team of my regular doctor to perform my surgery (it would be other doctor’s team). But as you can imagine, it’s hard to predict what will happen to a premature baby long term, as there are many factors involved. Children born prematurely are more likely to have significant problems with cognition, walking, talking, vision, and hearing, than those born at term. In fact, those problems may not be noticeable until the child is older. One or more of these problems affects about 1 in 25 children born at term, but 1 in every 12 babies born at 30-32 weeks have a major problem in one or more of those areas. I received a detailed explanation about many other specific problems, such as breathing, feeding, brain, heart, infection, eyes, blood transfusions, and jaundice. This information was to help me understand what our babies might face once they were born. Even though I had passed the 32 week mark, I still felt very stressed and frightened with the prospects I was presented with. On the day prior to the caesarean birth, the midwife caring for me checked my temperature, blood pressure, and my abdomen to feel the triplet’s positions and listen to their heartbeats. There were quite a few forms to check and sign, like name tags and consent forms. I also needed a small shave from the pubic hairline to the bikini line, which the midwife did it for me. As you can imagine, I couldn’t see anything below my bump! After that, the anaesthetist visited me in the ward, and my husband changed into theatre wear for the surgery. Immediately before leaving for theatre, I was given a tablet of Zantac for my nausea. The checklist was done! I was then taken to theatre on my bed. We didn’t forget to take our camera, but I wish we had bought a new professional camera back then! The anaesthetist explained the anaesthetic process to me. The IV drip was then inserted into my arm, and I was asked to lie down on my side and curl my back. I could feel the cold antiseptic wash, and the sterile drapes placed on my back. They gave me a local anaesthetic, which felt like a mosquito bite. Then I felt pressure and prodding as the anaesthetist felt for my spinal column. The spinal needle was inserted, and then the anaesthetic drug was given! I felt a strange sensation down my leg, followed by numbness. I didn’t feel anything after that, but I knew that a urinary catheter was being inserted into my bladder. They checked to see if I could feel anything in my legs, and I couldn’t. The screen was put up across my chest so me and my husband would not see the actual operation. I was given oxygen via a mask, and by this time my husband was already by my side. There were monitors everywhere, sticky pads on my chest and legs, and a peg on my finger. Amazingly, there were so many people in the theatre: my obstetrician, his assistants, an anaesthetist, theatre nurses, two paediatricians and midwives. Once the spinal anaesthetic had started working, my doctor proceeded with the operation. I heard a slight suction sound and felt some pressure, almost like a pushing and pulling sensation. My husband told me that the doctor had already made the first cut, and I hadn’t even felt when he put the knife on my skin! 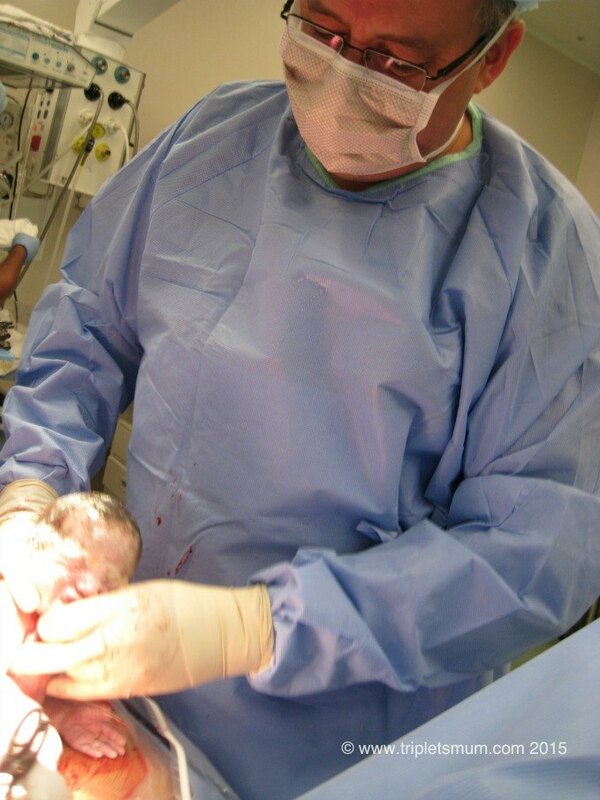 It took about five minutes for the first triplet to be born, and my doctor then showed our first baby to us! Her name is Kate. After we got a look at her, the doctor handed Kate over to her paediatrician. The paediatrician checked her over and gave Kate a vitamin K injection. A cord clamp was placed on Kate’s cord stump and she was wrapped in a warm blanket. After that, she was given back to us and placed on my chest. She was so tiny! I began to feel tears in my eyes, it was such a beautiful and overwhelming feeling. One minute later, my doctor showed us triplet two. We named him Sam. And then another minute later – triplet three. Her name is Bo. It was over so quickly! I suddenly had three babies on my chest. The midwife took our first family photo five minutes after their birth. After that, my doctor began to stitch me up, which took about 30 minutes. I was then wheeled to the recovery area before I was taken back to the ward. During the time period that the anaesthetic slowly wore off, I was shaking uncontrollably. The nurse put a few warm blanket on me but that didn’t help at all. My triplets were placed into a portacot and taken to the special care nursery, and my husband went along with them. On my return to the ward, the staff made an effort to bring me by the nursery to visit the triplets. After the birth I was doing okay, but I really needed rest after my C-section. Although the bubs were born premature at 33 weeks 2 days, they were just fantastic! All three of them had no need for Intensive Care & went straight into nursery incubators. They were kept there to stay warm for a while, and went into regular cots over the next two days. I stayed in the hospital for six days, and the triplets stayed for about four weeks. I didn’t have any postnatal depression. Overall, I had a great experience, and left with triple the joy! I hope you enjoyed reading my birth experience. What was your birth like? Can you still remember the first moment you saw your baby/babies? Wasn’t it the most fantastic feeling? As always, please let me know if you have any questions about giving birth to triplets, and I would love to see your comment below!